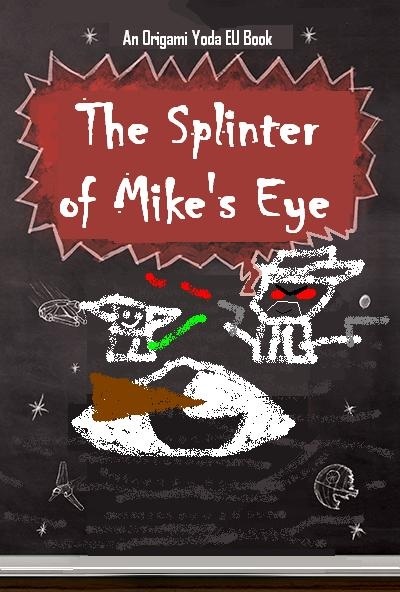 After a shocking confrontation between Chippy and Mike, we found out that Mike had secretly been creating the SuperFolder Protection League—under the sinister command of the mysterious Bounty Hunter known as V—and had planned an “Order 66”-type command, tricking all the kids we thought of as friends, such as Eggbert and Zach—into thinking WE were vandals and bullies! Now, I trusted Eggbert. He wasn’t evil when he blamed me. He just misunderstood the situation. But Mike took full advantage of him. After being bad in baseball, I wondered how he was so athletic, because he did a home base slide past the door Eggbert was guarding, and flew off. It was like the scene where General Creasious got on his huge bike and flew away from Obi-Wan! I looked around while I was running. There was not a doubt in my head: Mike was heading for the doors. So I realized my advantage. Mike has his mom drive him to school. It was pretty late in the school day, so Mike’s mom was probably either already in the parking lot, or she was still driving there. I ran outside and found Mike. His mom still wasn’t there. He glanced back at me, then pretended to ignore me as he paced the sidewalk. I walked up to him, placing my hand on his shoulder. His words stung. I guess I should have thought about it. But even he sounded pretty confident about her being V when he was zip-lock tied in a corner and we saved him. We met Jacob out on the playground. He was sitting on a small table with three different laptops, and all of them appeared to have their webcams on. “The members of the council are; Ryan Knight of Williams Middle School,” He gestured to the first laptop. It showed an African American kid with slick black hair. “Me,” he pointed to himself. He turned over to the second computer. “Francesa Boyd of Tolkien Middle,” She I knew. Kellen and I had ruined a budding relationship between her and- “Noah Jekan of Williams Middle, my brother.” I gasped. I hadn’t seen Noah in over a month. I didn’t know if he held a grudge. “Mike? Why?” blurted out Ryan. “And that is?” asked Frankie. “Bounty Hunters?” Noah said with surprise. He sat back a little too far and the chair that he was sitting on fell out from under him. “No Bounty Hunters. No V,” Noah quickly dismissed my claims. “Mike’s guilty. Case closed.” The laptop broadcasting Noah turned off. I was walking into the lunchroom, when I saw Sara, Lance, and Quavondo sitting at a table. “Hey guys, what’s up?” I said. Sara turned to me and said “Hey Kellen…” She kinda seemed gloomy. She handed the note to me. I picked it up, and began reading through it. I began leaving the cafeteria with Lance and Quavondo when Luke Skyfolder was shot off my finger by a paper airplane dart. I looked up to find—thanks Sara—Harold Hummer, with an origami Gold Squadron of paper darts! I ran past the flying darts, but a couple of them hit me. One of them actually gave me a nice paper cut. We all glanced at each other. I was told by Tommy that I was supposed to clear our names. All I was doing was making the situation worse! Some students quietly considered this, but others kept booing and hissing. They began throwing their food at us. A full-scale food fight had begun! I grabbed a couple packs of hot sauce from one of the angry students. I’d keep it for later, just in case. “Run, you must!” Fruitigami Yoda said from Dwight’s finger. “Handle these hooligans, I will!” Dwight ate Yoda, stood up from his table, and began eating all the food that was being thrown, in mid-air! We ran from the cafeteria, but Harold followed us. We ran into the library, Harold following us, and bumped into Ruth. Harold picked up a book from the shelf behind me. On its cover it said, “Star Wars: The Essential Guide to Vehicles and Vessels”. Inside were marked pages. “We’re going to be making these bad boys out of … Office Supplies!” cackled Harold, as he expertly turned a stapler into a Star Destroyer. “V will be very pleased….” Ruth said. I couldn’t move. If I did, Ruth might rip the case files into pieces. I was trapped. “I’ll never turn to the Dark Side,” I smiled, whipping out my hot sauce packets. The two of us stood still. If we moved, the case files would be gone and Ruth would be covered in Diablos’ sauce. I stepped back, keeping my packets ready to squeeze and fire. I winked behind Ruth. Mrs. Calhoun snatched the case files, and kept Ruth from going anywhere. I tried to block Harold, but he shoved past me and made his escape. Tommy and I met up with Chippy at Dom and Billy’s Pizza Parlor. Chippy ordered us a small pizza—Tommy was suspicious of this—and laid it down on the table. “Mind if I pray?” Chippy said. Tommy shifted uncomfortably, but I didn’t mind. After praying, Chippy sliced the pizza into three equal pieces for each of us…well, he tried to. Tommy’s slice looked more like a pre-eaten pizza boat than a pizza slice. I took a bite of my pizza. I choked and spit it out. I tried not to draw attention to myself, but Tommy noticed. Tommy glared at Chippy. The kid had long unruly blonde hair, kinda like Dwight’s. It could easily get into stuff. Tommy’s Comment: This was frankly so embarrassing for me, and I didn’t want Harvey commenting about it, so I deleted most of it. But yeah, Sara thinks I’m pretty awesome. “What happened?” Tommy demanded. He had a vendetta with that kid. He’d actually helped lead them straight to the Bounty Hunters the first time. But could that have been just a ploy to get them off the Bounty Hunters’ track? Chippy cleared his throat, and started his story. So, Arnold and I heard Lawrence and some bullies at lunch say that V and some new Bounty Hunters were planning to personally fill the school with their vandalism. They were all meeting in the art room. When we got there, I ducked behind a trash can. Arnold hid underneath a desk. I didn’t see Bo-bag Fett. Instead, I saw Tony with Jango Felt, and some familiar bad dudes. But their leader wasn’t Jango. It was…get this…Cut Bane. All the Bounty Hunters seemed to be looking up to him, but the kid wielding Bane was blocked from my vision because all the other kids were swarming him. He quietly waded through the group, and stood boldly away from them. He was totally decked out like a Western cowboy dude. Striking black boots, dark skinny jeans, a navy blue vest over a brown shirt, and – like Tommy said – a cowboy hat was perched atop his head. What his hat’s brim didn’t cover of his face was obscured by his long blond hair. He smirked. I held my breath. Had he noticed me? Arnold didn’t quiver or get scared or anything. Instead, he stood up, brushed off his pants, and looked Vernon straight in the eye. “I’m your newest recruit. Arnold Farrell. There’s a kid – a spy – hiding right underneath that desk.” He pointed towards me. I was betrayed. As soon as Vernon moved the desk, I ran. I bolted out the door before they could catch me. “Why didn’t you tell us that sooner? ?” I bolted up from my seat, rode my bike home, and began writing all of this down. Then I called up Mike. I walked into the Principal’s Office. Vernon was sitting in the principal’s chair. “You vandalized the school,” I glared at him. I turned on Kellen’s recording-thingy from my back pocket. I’d need to have the truth recorded if I was gonna get Vernon busted. I cautiously made my way to the seat, and sat down, carefully making sure not to stifle the microphone segment of the recording-thingy. Tommy: So, your cousin made Vanessa and her friends nervous about everything, and then they made their club, and you ruined it. Tommy: So…you ran this whole thing? You were V? Vernon: C’mon. I told you this already. Sheesh. Vernon: I don’t have to. You just did. Vernon: Sweet niblets, I was right. You’re trying to blackmail me. But thank ye greatly, Tommy. I’ll get Lawrence to edit the audio, to prove the terrible truth to all of yer friends: You were V all along. And I, the heroic Vernon O’Brian, stopped you. Mike: Say hello to my little friend! Mike: Tommy, I got the recorder! Let’s get out of here! Vernon: Well played…well played…..But this isn’t over. Chapter 8: When Will This Craziness Ever End??? We had Vernon. Kellen’s Rebellion against “Operation: Yavada” worked out. And now, McQuarrie was finally, FINALLY free from the Bounty Hunter vandals. Any kids left who had been part of that operation—Lawrence, Harold, Ruth, even Mister Tony D. Struction himself—were forcibly transferred to other schools. I’m just happy we didn’t have to resort to any of this stuff with violence, or else we probably would’ve gotten in trouble too. (Well, okay, Mike threw an origami dart at Vernon, but that can be justified). We held our victory celebration in the Bounty Hunters’ old hideout, where we were allowed to Yub Nub to our hearts’ content! Math Teacher Rabbski even joined in too! Plus, we had another reason to celebrate! Since Mrs. Yavada obviously wasn’t really our principal, we were given an announcement about our new McQuarrie Middle School Principal. Kellen’s screaming was music to Howell’s ears. He finally had his dream position. He laughed loudly, and I couldn’t help but feel great. If Principal Howell was the worst of our troubles, well… I’m sure the rest of this year will be just fine. We all circled around Yoda, and waited patiently for him to begin. But instead of Yoda, this time Dwight told us the prophecy, in plain English. No Yoda talk. The evil foe. McQuarrie’s fear. At the return of the dreaded FUNpire. Thanks Eggbert! I hope you liked the story! Can I? You can probably guess my name from my account, but it’s Sean. Liked it? I LOVED it! Put sfTANNER IN THE next one please. His real name is tanner. I was finishing the editing process on it! The story is finished and back on the website now! Tanner will definitely be in Heir to the FUNpire….along with Xavier…. Haha who did this? LOL cause I didn’t! Seriously! Still can’t believe Arnold was turned evil!